That’s all it took for Handel Estivene’s world to crumble around him. When it happened, Mr. Estivene didn’t know if he had been in a car wreck or if a bomb had been detonated. All he knew is the ground was shaking. Buildings were falling around him, and everything turned white with the dust from debris. It took a moment to realize he had been in an earthquake, one of the most destructive ever. That was Jan. 12, 2010 outside of Port-au-Prince, Haiti. It registered 7 on the Richter scale and was responsible for the deaths of more than 100,000 people. More than 300,000 were estimated to have been injured, and approximately 1.5 million people were displaced. Mr. Estivene was only 15 at the time, but his family made the hard decision to send him to America alone, knowing it would give him more opportunities than if he stayed in Haiti. That is what eventually led him to where he is today: a soon-to-be graduate of Dalton State College with a degree in marketing. Haiti was in political turmoil in the mid-1990s, which led to gunfire in Port-au-Prince on a regular basis. With the hospital downtown, Mr. Estivene’s mother didn’t feel safe giving birth there. Instead, she flew to the states to stay with her sister until Haiti was safe again. This gave Mr. Estivene status as an American citizen. That decision is what set his path in Dalton 23 years later. Education was so important to Mr. Estivene’s family, they enrolled him in strict Catholic schools in Port-au-Prince, approximately an hour away from his home. The day of the earthquake had been an early release day at the high school. Mr. Estivene was on the way from home, in the car with his older brother and their two best friends, when the ground began shaking. In a panic, Mr. Estivene began laughing hysterically and shaking all over. Rubble filled the streets. It was impossible to drive, so the boys began running home. Resources were already limited in Haiti, and it was clear they would be even more limited following the earthquake. Haiti was a poor country full of corruption and rebellions, he said. The country was already struggling, and in that moment, any progress that had been made was lost. Soon the word spread that American citizens had only to show up at the airport with their passports, and they could leave Haiti. “My mom said, ‘You either go out of the country or you live with your uncle,’” Mr. Estivene said. “She was saying she didn’t know how the country was going to be after the earthquake. Supplies were limited. Criminals had escaped jails. You were seeing death, bodies, robberies. People were hungry; they were just trying to survive. Mr. Estivene was put on a plane to Orlando. He didn’t speak English. He was given a phone number to contact an aunt when he landed, but since communications were down in Haiti she didn’t know to expect him ahead of time. He expected his time in the states to be limited to a month or two and never quite felt at home at his aunt’s in Florida, so he asked his parents to come home. Instead, his parents put him on another plane. This time to Atlanta to live with a family he’d never met. He was confused because he wanted to go home to Haiti but his parents decided it wasn’t safe for him to return yet. Mr. Estivene’s dad is a Baptist minister, and missionaries had been staying with him in Haiti. A missionary had overheard a conversation about Mr. Estivene not wanting to live in Florida and offered him a home. “The missionary made a call to his wife and asked how she felt about having a Haitian kid come live with them for a few months,” he said. “I got to Atlanta in February, and it was cold, and I didn’t have a coat. And there’s this man waiting on me I’d never met before. I landed in Atlanta on Friday, and by Monday I was in high school. Over time, Mr. Estivene began to adapt to life as a teenager in America, and the couple in Atlanta became his legal guardians. Life at Dalton State was a stark contrast to what he experienced in the Atlanta area high school. Struggles to become proficient in English didn’t hold Mr. Estivene back at Dalton State. And he soon learned how to ask for help, when to ask for help, and where to ask for help. “The campus is beautiful, and it’s a small community that helps each other out,” he said. “From start to finish Dalton State prepares you fully to be successful. My business law class taught me some of the politics involved in starting a company. My integrated marketing class taught me how to develop a brand. The professors here have given me the tools I need to succeed all the way to the end. Mr. Estivene wishes he had taken advantage of that sooner. During his freshman and sophomore years, if he struggled, Mr. Estivene dropped a class rather than go ask for help. “We value the contribution of our international and foreign-born students,” said Dr. Marilyn Helms, dean of the Wright School of Business. “We view them as an asset to our classes. I had the pleasure of having Handel in my Principles of Management class. When we covered international management issues I would call on Handel and other international students to add updates to our textbook examples. This gave them more practice speaking in English but more importantly, they are able to share similarities and differences among the various cultures represented. They became ‘experts’ in class, and students would ask them questions. It benefited all our students. Mr. Estivene isn’t sure what he wants to do when he graduates. He is currently looking for a job in sales or marketing. 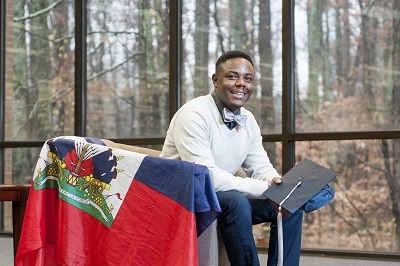 He hopes to work in the states for approximately 10 years before moving back to Haiti where he wants to help develop local businesses to stimulate the economy there. There are many times, even today, that he fears the ground is shaking. He’ll look at others to see if they’re reacting, and if not, he knows the shaking he’s feeling is not real.